The Multi-Batch Patriot™ program was developed to be used by organizations such as data processors, service bureaus and other organizations that process multiple data files for clients. Its purpose is to assist in compliance with regulatory issues for Anti-Money Laundering (AML), Anti-Terrorism, the USA PATRIOT Act, Office of Foreign Assets Control (OFAC), Bank Secrecy Act (BSA), FinCEN 314(a) and other related domestic and foreign governmental regulatory requirements. The Multi-Batch Patriot™ provides the ability to be in compliance with these regulations in the most cost-effective and least time consuming manner. The Multi-Batch Patriot™ is based on .NET technology and is a database-matching engine that provides searches of client databases, against the U.S. Department of Treasury's OFAC SDN, OFAC PLC and FinCEN 314(a) provided database. 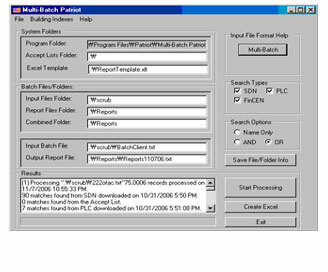 This "user friendly" software application has a live update function that allows you to expeditiously retrieve the updated OFAC SDN and OFAC PLC data with the simple click of a button, as well as an import master files function that allows you to expeditiously import the updated information from FinCEN that contains the Master People and the Master Business files of information. The Multi-Batch Patriot™ program is unique as the market provides limited resources to obtain, format, and utilize the vast amount of provided data. The Multi-Batch Patriot™ program is scalable to add or change functionality and can be customized to meet your needs as well as addressing additional watch lists as government regulations require. The Multi-Batch Patriot™ program is network ready and can be installed on a server along with multiple workstations on a network or individually on single workstations. The Multi-Batch Patriot™ program is completely scalable to seamlessly integrate into your existing systems and can be provided as a "private label" program. In order to download a no-obligation, 10-day trial evaluation version of the Multi-Batch Patriot™ program, please submit your requests via the above listed contact reference point.